Hard Rock Cafe at Yankee Stadium gives you an opportunity to enjoy more than baseball. I had the opportunity to spend an evening with some Bronx Bloggers getting to know a little more about Hard Rock Cafe at Yankee Stadium. I must admit I had to think very hard as to where the entrance to the Hard Rock Cafe was at Yankee Stadium, after all when I go to a game there’s a sea of pinstripes and my main goal is to find the shortest line to enter the stadium. Located right on 161st and River Avenue, this is one restaurant worth adding to your list of places to eat. 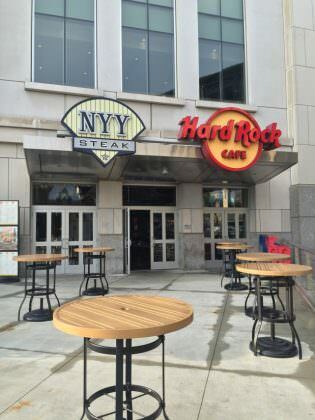 Hard Rock Cafe at Yankee Stadium has a separate entrance and it is open during both game days and off days. During game days you do not need to have a ticket to the game, however, you still have to go through security to enter the restaurant. The restaurant has game day and non game day hours posted on their website Hard Rock Cafe Yankee Stadium, along with events. When you dine at Hard Rock Cafe here in The Bronx, you’ll get the rock ‘n’ roll theme displaying memorabilia of New York based artist with The Bronx twist. My personal favorite is of course a signed guitar from former Yankees center fielder and musician, Bernie Williams number 51. Having visited Hard Rock Cafe on a Tuesday evening, non game day, the restaurant was not crowded. As it was not a game day I opted to drive and street parking was fairly easy, but I know the area. Public transportation is very close (D and 4 train) and if you don’t wish to look for street parking there are various lots nearby. Hard Rock Cafe at Yankee Stadium offers great food and service at reasonable prices and a chill atmosphere. If you’re looking to make it an evening there is of course the opportunity to dine before a game. However, if you’re not interested in baseball you can dine at Hard Rock Cafe before heading to a show at the Lehman Center for the Performing Arts (250 Bedford Park Blvd.) or at Pregones Theater (571-575 Walton Avenue). While both places are not walking distance they are a short distance via train or car from the restaurant.